Colleran Auctioneers is selling a special property on Salthill promenade. Not only does it offer breathtaking views of Galway Bay from sunrise to sunset, but it is located in the Claddagh, one of Galway's most sought after locations. 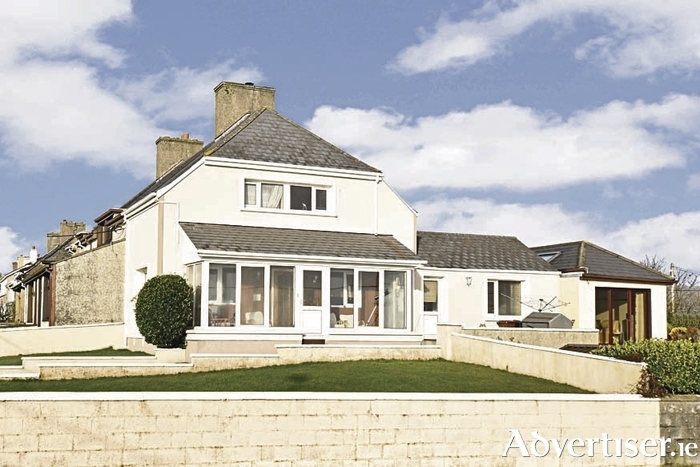 It is the second Claddagh property to be included in Don Colleran's next auction. No 12 Grattan Terrace is a small, compact, three bedroom house sitting on an elevated site overlooking the bay. One of the many special attractions of this property is that every window, both upstairs and downstairs, looks onto the sea. Accommodation includes a large double glazed porch to the front of the house, sitting room with open fireplace, kitchen with stove, ground floor bedroom and bathroom. On the first floor there are two double bedrooms. There is a small garden to the front of this house, off-street parking, and a sloped driveway to the front door, with no steps. In his 33 years selling property in the Claddagh, Don Colleran says he has never offered a property for sale "quite like Grattan Terrace". It is for sale by public auction on Thursday March 16 at an advised minimum value of €340,000. Open viewing is on Saturday 1.45pm -2.15pm. Also included in Collerans' next auction is 16 Elm Park, Renmore, AMV €260,000, open viewing 11-11.30am, 160 Castlelawn Heights, AMV €180,000, open viewing 12-12.30pm, 35 Cookes Terrace, Bohermore, AMV €195,000, open viewing 12.45-1.15pm, and 6 St Dominick's Road, Claddagh, AMV €360,000, open viewing 2.30-3pm. For further information visit www.collerans.com or contact Colleran Auctioneers 091-562293.